To Rangers people, Mike Ashley must seem akin to a character in a horror movie, a vengeful bogey man who's there and then not there, who's everywhere and nowhere. 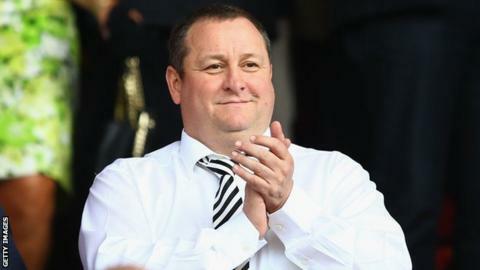 In an attempt to make Ashley less of a nuisance, Rangers announced on Friday that they intend to repay the £5m loan the Newcastle United owner gave to the chronic old board at Ibrox. It's a u-turn, of course; a major one, but a logical one. Dave King, the Rangers chairman, said previously that the club had no need to repay the loan anytime soon and, indeed, he said it was his belief that Rangers might not have to pay it at all. Belatedly, he has come to the conclusion that if he wants Ashley out of Rangers' life then it would be a good idea to pay him what he is owed. King and Rangers versus Ashley is far from over. Ashley's dealings with the club, where he will continue to enjoy a handy earner on the retail side for many more years thanks to the hapless previous administration, are about as subtle as a punch in the face. He believes that King and the current regime are messing him about. At Rangers, they think Ashley is meddlesome. Ashley has a battalion of lawyers watching everything and everybody connected with Rangers - most notably King. The Sports Direct man appears to be on a mission and the mission endgame seems to be King being driven off the board. The chairman of Rangers has fought a battle or two in his time in South Africa, but he probably thought the South African Revenue Service (SARS), in chasing him down and getting him convicted for 41 breaches of the income tax act, could never be topped in terms of an adversary that would not quit. It won't be, but Ashley is giving it a fair old rattle all the same. As well as placing a gagging order on the Rangers board and preventing them from revealing details of his contracts with the club, the Englishman has won the right to have the Scottish Football Association's ruling on King as a fit and proper person challenged at a judicial review. A two-day hearing on the matter is set for the end of April next year. Unlike previous AGMs there wasn't a gazebo or a boo boy to be found on Friday. The mood, we're told, was one of togetherness. Good karma has been a long time coming. A year ago the AGM had all the decorum of an episode of the Jeremy Kyle show. In that regard, there's been a profound change. King, in fairness to him, didn't shirk the reality on the football side. This is another test of his, and his board's mettle. Hibs are putting it up to Rangers. Promotion, as champions, is no longer the sure thing that it looked some months ago. The message is that Rangers will invest in players in January. Thankfully, this version of King - there are a number of versions - was measured and mature. There was no hubris of the kind we have seen from him in the past, none of the outlandish "whatever it takes" comments or vows to spend his children's inheritance to get Rangers back to the top. He announced that Rangers would now start paying the living wage, a feelgood moment for all supporters. He has dropped his one-time mantra of throwing money at a title chase. He once indicated Rangers might have to increase the player budget by three or four times when they get to the Premiership. If they get to the Premiership. We saw a more exact and a more focused King. He said the Rangers team would need to strengthen and pretty much left it at that. He said the target was to be competitive in the Premiership next season and to make the Europa League. Sensible. The scale of the strengthening in January will be key because Rangers cannot afford another season in the Championship. Everything that King says about moving the club forward and making it financially stable and capable of standing on its own two feet is predicated on top-flight football and the better revenue streams that it would bring. They need promotion like they need their next breath. They remain favourites to achieve it - either as champions or through the play-offs - but it will be fascinating to see what they do - or can afford to do - in January to make the ascent more likely. It's another test of King and his board. Ashley wasn't there on Friday. Not in body at any rate. In spirit, he's never far away. The repayment of £5m is not likely to change that. With Ashley, it's less about the money - a pittance for one so wealthy - and more about the machismo. He is the link to the dog days of the previous regime and King's most formidable rival since SARS.